Uncertainty about the effects of land use and climate on water movement in the unsaturated zone and on groundwater recharge rates can lead to uncertainty in water budgets used for groundwater-flow models. To better understand these effects, a cooperative study between the U.S. Geological Survey and the Central Platte Natural Resources District was initiated in 2007 to determine field-based estimates of recharge rates in selected land-use areas of the Central Platte Natural Resources District in Nebraska. Measured total water potential and unsaturated-zone profiles of tritium, chloride, nitrate as nitrogen, and bromide, along with groundwater-age dates, were used to evaluate water movement in the unsaturated zone and groundwater recharge rates in the central Platte River study area. Eight study sites represented an east-west precipitation contrast across the study area—four beneath groundwater-irrigated cropland (sites 2, 5, and 6 were irrigated corn and site 7 was irrigated alfalfa/corn rotation), three beneath rangeland (sites 1, 4, and 8), and one beneath nonirrigated cropland, or dryland (site 3). Measurements of transient vertical gradients in total water potential indicated that periodic wetting fronts reached greater mean maximum depths beneath the irrigated sites than beneath the rangeland sites, in part, because of the presence of greater and constant antecedent moisture. The depth of the peak post-bomb tritium concentration or the interface between the pre-bomb/post-bomb tritium, along with a tritium mass balance, within sampled soil profiles were used to estimate water fluxes in the unsaturated zone at three of the eight study sites. Chloride mass-balance method was used to determine water fluxes below the root zone at the rangeland sites: sites 1, 4, and 8. Site 1 had a greater mean water flux, which was consistent with the greater precipitation in the east than at site 8 in the west. Movement of bromide through the unsaturated zone indicated greater water fluxes are found beneath irrigated lands than beneath rangeland. Apparent groundwater age was used to determine the groundwater residence time at the eight sites and to estimate recharge rates. Overall, these data generally indicate that water movement within the unsaturated zone primarily is affected by spatial contrasts in mean annual precipitation and by the land use or land cover. The eight unsaturated-zone sites each generated unique, valuable datasets that likely will improve the understanding of water movement and recharge rates in the central Platte River valley. 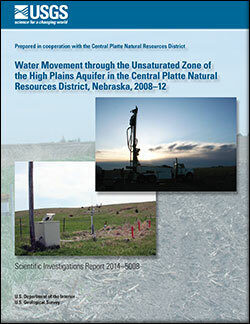 Steele, G.V., Gurdak, J.J., and Hobza, C.M., 2014, Water movement through the unsaturated zone of the High Plains Aquifer in the Central Platte Natural Resources District, Nebraska, 2008–12: U.S. Geological Survey Scientific Investigations Report 2014–5008, 51 p., plus tables and app., http://dx.doi.org/10.3133/sir20145008.